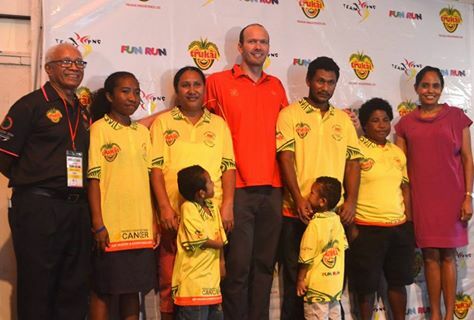 Trukai Industries Limited today launched the National 2016 Trukai Fun Run in Port Moresby. This will be the 17 year Trukai has hosted this vital fundraising event, which will take place in Port Moresby, Lae and other major centres. The 2016 Trukai Fun Run T-shirt Auction for Port Moresby will be on the 17 of March and for Lae, 16th of March with the Trukai Fun Run be held nationwide on the 26th of June this year. This year, the Trukai Fun Run fundraising drive, will be one of the major events to support Team PNG for the Rio Olympic Games in Brazil. Trukai will be raising K500, 000.00 from this event to support our local athletes who will be taking part in seven individual sport competitions. Trukai National Marketing Manager Ms. Maybellyn Fernandes said last year, 16 provinces participated in the Trukai Fun Run with over 40,000 participants. Trukai will be giving 100,000 T-Shirts as contribution to the fundraising drive for Team PNG to Rio Olympic Games. President of PNG Olympic Committee Sir John Dawanicura thanked Trukai Industries for their support as one of the major sponsor’s to send Team PNG to the Rio Olympics and also making the community aware of our local athletes participating in this international sports event through Trukai Fun Run.